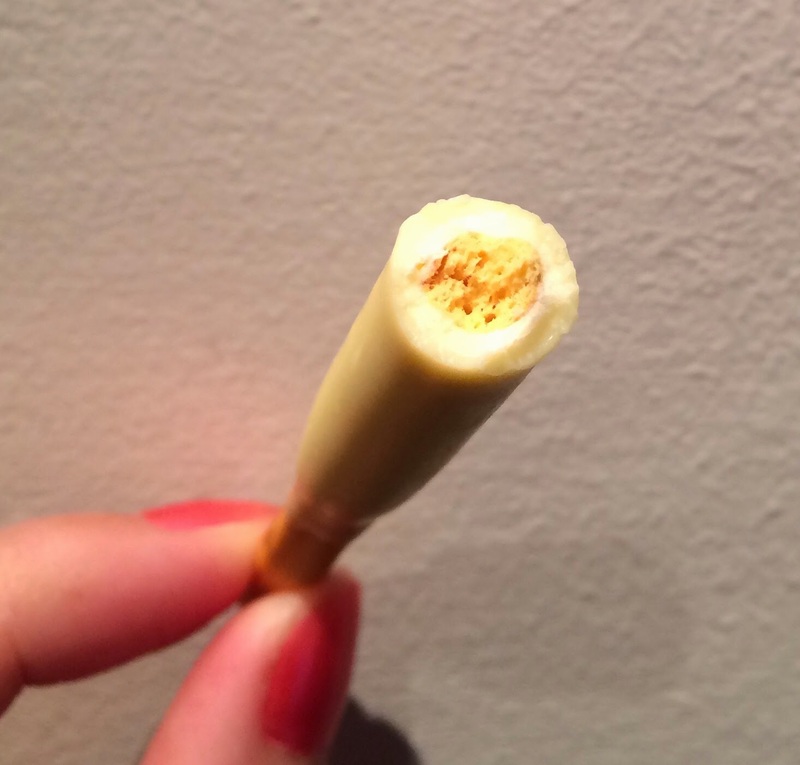 Glico launched a new "Pocky Midi <Buttery Glamorous Pouty Custard>" on February 17, 2015 for a limited time. I'm not sure how to put the name into proper English, but the direct translation would be "butter beautifies pouty custard." This item was produced in collaboration with Kirin's 午後の紅茶 (Gogo No Kocha, Afternoon Tea) Apple Tea with Subtle Cinnamon Scent," and according to a press release, if you eat this Pocky Midi and drink the Apple Tea, you'd taste apple pie. The box has 2 different designs; a prince and a princess, and the bottle of the tea has 2 different patterns (or 2 on 1 bottle), also, and if you pair them up properly, when you place them next to each other, they look like a princess and a prince are holding their hands. On the to of the package, it says, "Pocky midi goes well with Gogo No Kocha." 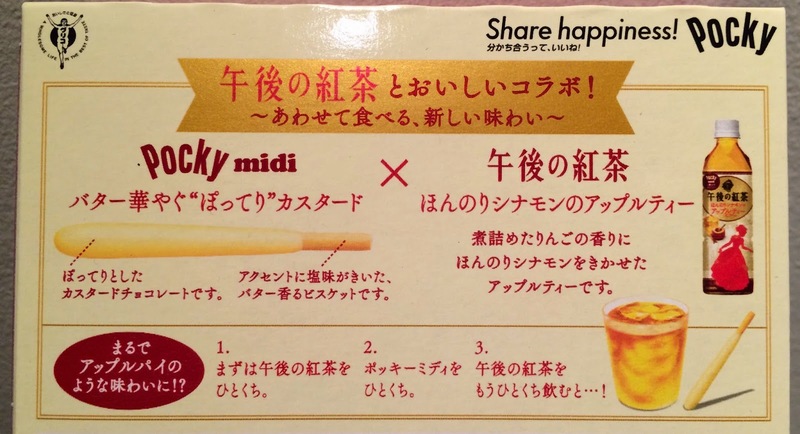 On the back, there're descriptions of the Pocky Midi and how to create apple pie flavor. 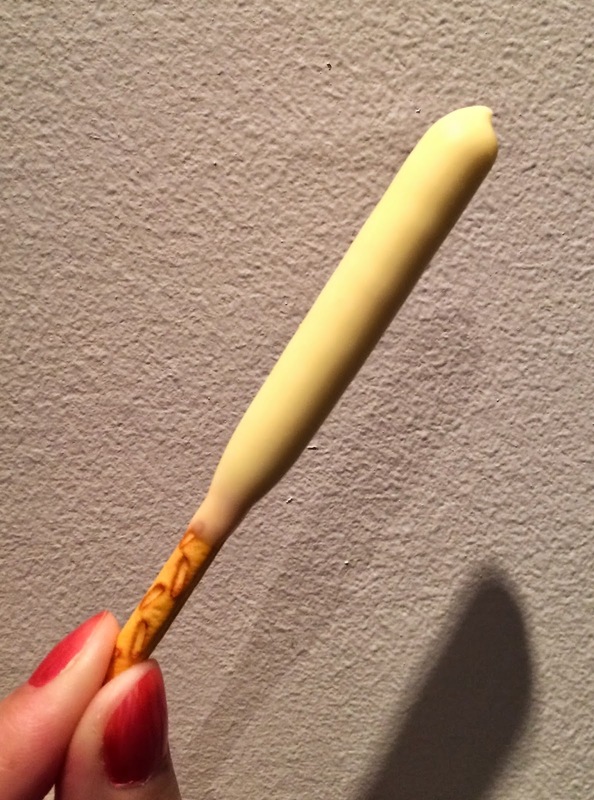 Pocky Midi; buttery biscuit with a hint of saltiness covered with pouty custard chocolate. Gogo No Kocha Apple Tea with Subtle Cinnamon Flavor; apple tea with cooked down apple flavor with cinnamon. It'll taste as if it's an apple pie!? 1. Drink Gogo No Kocha. 2. Eat the Pocky Midi. 3. Drink Gogo No Kocha again, then you'll taste apple pie. 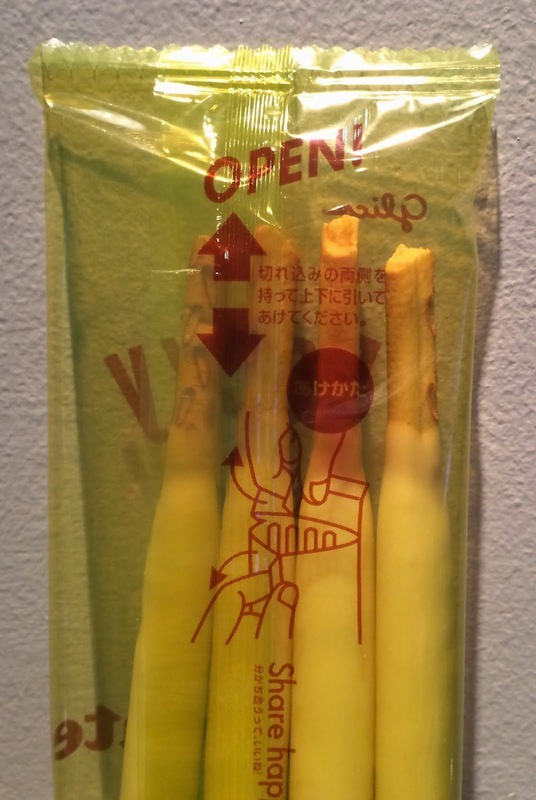 There're 3 individual pouches inside. On the back, there's a note "how to open," and I pulled the arrows towards opposite directions. It had very sweet scent, and I only tasted incredibly sweet white chocolate, not custard. 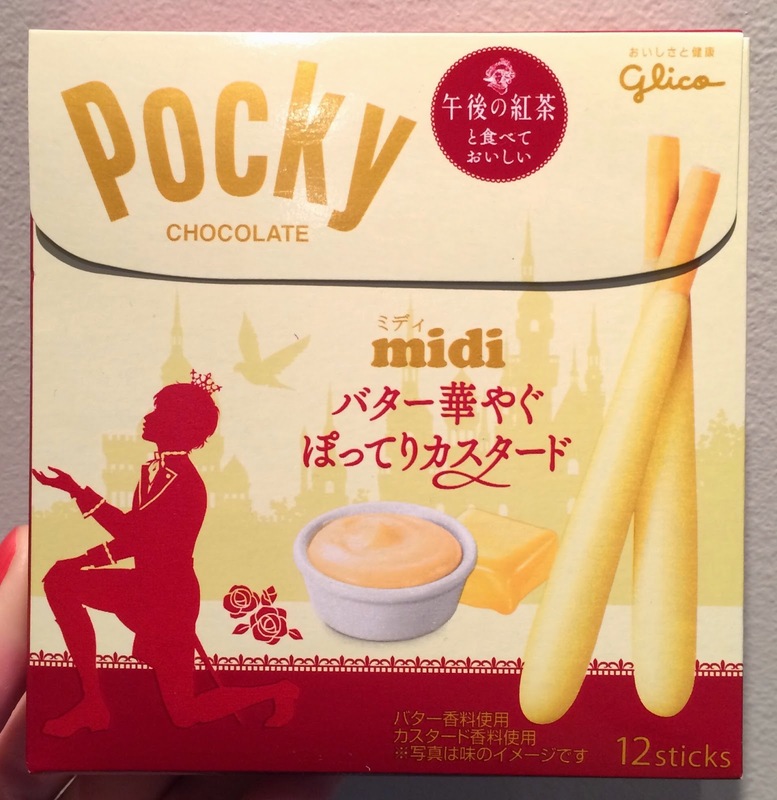 Pocky Midi consists of 75% of chocolate and it's quite high so that I couldn't really taste any buttery flavor in the biscuit. I thought it's just a crazy sweet Pocky. My husband didn't know about this press release so I didn't have the Gogo No Kocha, and I tried the Pocky Midi with green tea, but unfortunately, it didn't work. right? Sometimes I doubt my sensory too :p and btw, I found that こどものビール Got myself two flavors actually, the yellow one (the one you reviewed) and the red one (tasted like grape soda to me) and I'm as amazed as you when I saw the foam formed by the soda, so real!! The grape flavor sounds actually good as the yellow one was close to オロナミンC, sort of. Yes, the form was the interesting and super fluffy!